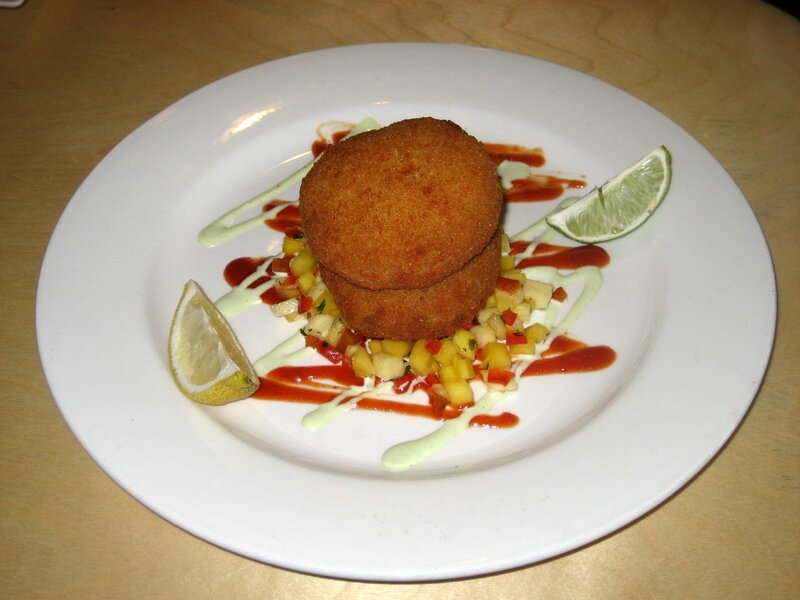 Two deep-fried crab cakes served atop pineapple and mango salsa. We were impressed with the size of the crab cakes, especially for the affordable happy hour price. However, once we bit into it, there was very little crab taste. It seemed there was more filler than real crab. Also, the outer fried shell was thick and overpowering. The salsa was absolutely delicious, even when eaten by itself. The presentation of the dish (stacking one cake atop the other) could have been better. 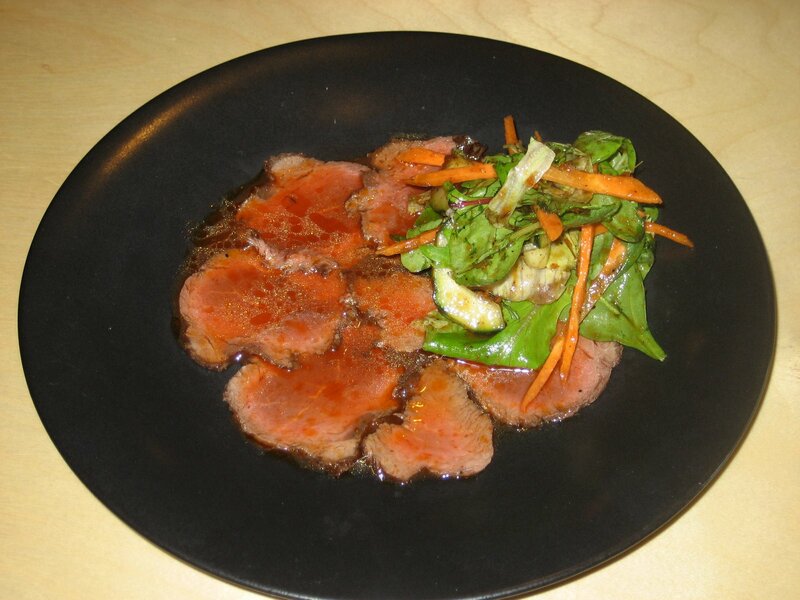 Thinly sliced beef with spinach, carrot, cucumber, and sriracha-lime sauce. We were blown away by this seemingly ordinary dish. 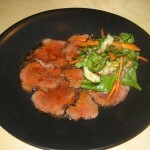 The beef was very tender and flavorful and the sauce complemented it perfectly. Our mouths are watering just thinking about it! We would definitely order this one again. 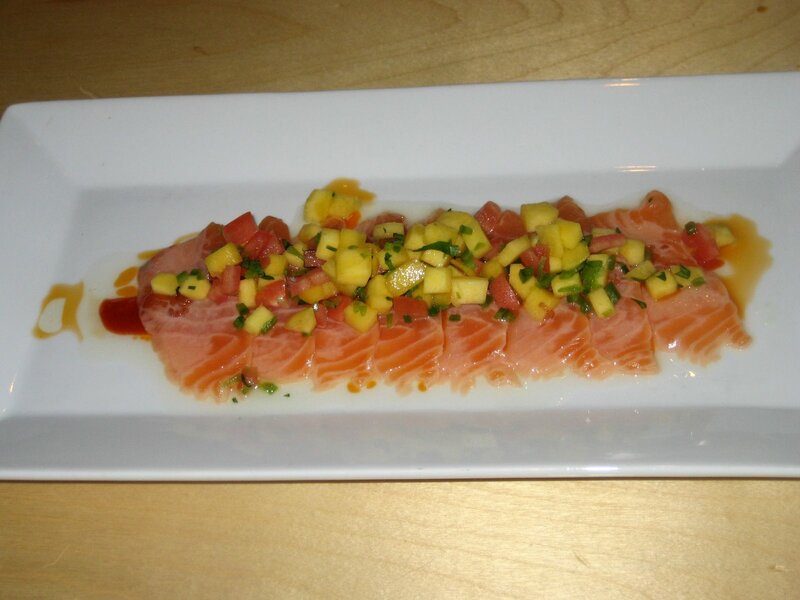 Salmon topped with jalapeno, cilantro, and mango. This is a cool and refreshing appetizer that is perfect for those humid Austin days. 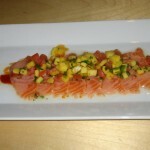 The salmon was fresh and the topping added a sweet and slightly spicy flavor. This is another winner that we would order again. Sesame seared tuna over mild chili, aioli, & wasabi cream. The tuna pieces were seared nicely and tasted fresh. The sauces and toppings added some pizazz to an otherwise plain dish. This is a great option to begin with to whet your appetite. Panko crusted roll with salmon, cream cheese, and scallions. When we saw this roll on the menu, we had to order it since it sounded so unique. 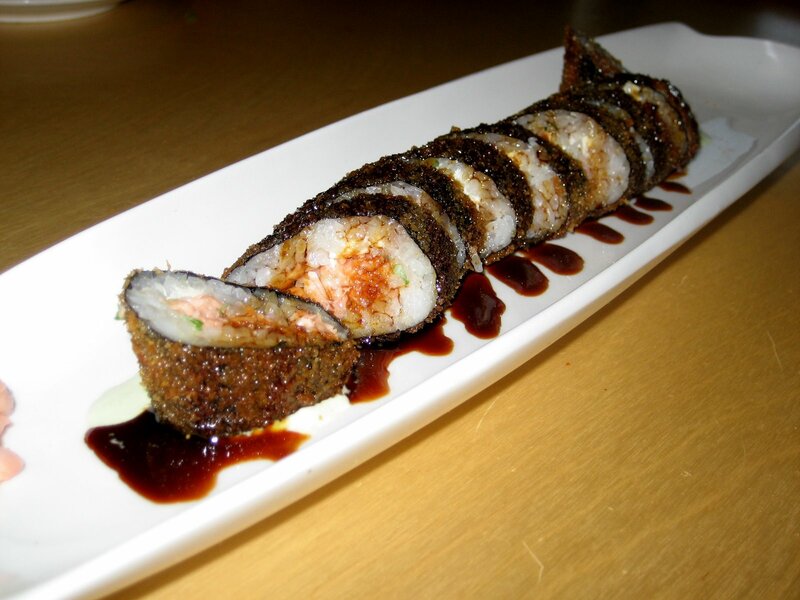 The name of the roll is a bit misleading since the roll is crusted in panko, not wasabi. The wasabi is in the sauce that is under the roll. 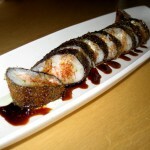 The roll had a mild flavor, but the panko provided a nice crispy texture. 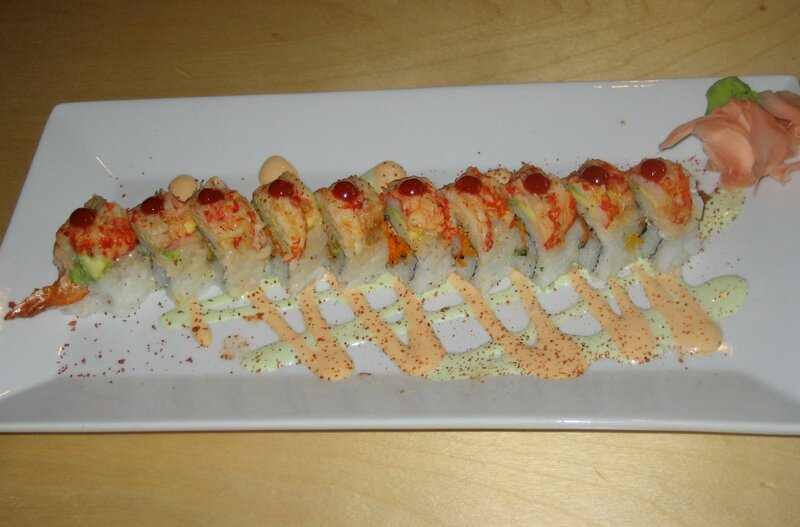 Roll with masago, scallions, shrimp tempura & ginger cream topped with avocado & crawfish. This was our favorite roll out of the bunch. The chef prepared this savory roll flawlessly. Even with all the ingredients, the flavorful crawfish shined through. The ginger cream sauce was an excellent compliment and the sriracha droplet added some flare. 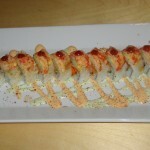 When you visit Piranha, don’t “forget” about this roll! 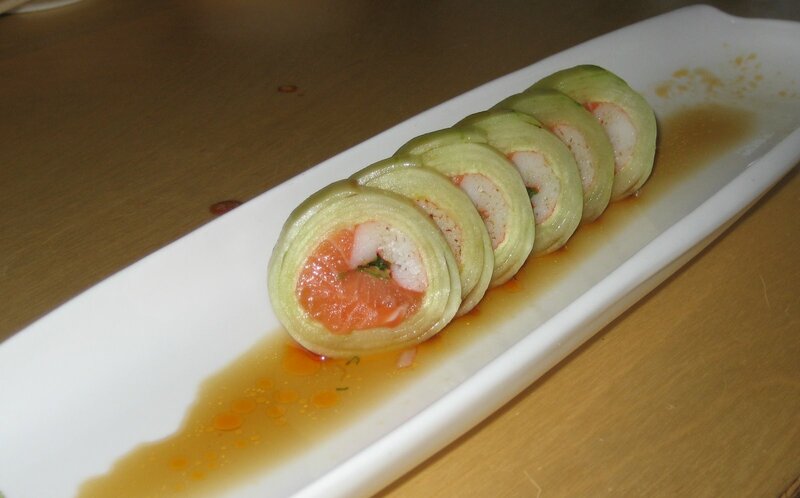 Riceless roll with salmon, crab & scallions wrapped with hand peeled cucumber. This is a good option for those looking for a low-carb roll. Instead of rice, this one is rolled in cucumber. The salmon was fresh however, there were too many layers of cucumber which overpowered the rest of the ingredients. 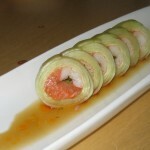 We recommend trying the riceless roll at Sushi Zushi. 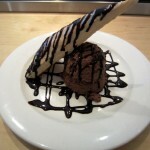 A double scoop of decadent amaretto mousse, drizzled with chocolate sauce on top. This dessert includes a light, wafer-like biscuit which compliments the richness of the mousse. The amaretto flavor shines through and is completely addictive. This was a wonderful way to to end our meal. It was not very heavy, yet still a chocolate-lover’s dream. 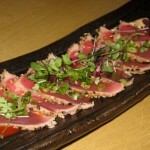 We dined at Piranha on a Saturday afternoon for happy hour. When we entered the restaurant, we were greeted by the hostess and taken to our seats. We had the place almost to ourselves which was great, because it gave us a chance to dine at the sushi bar. We had lovely conversations with the chefs and learned a lot about the restaurant, the staff, and the food! Our waitress checked up on us at appropriate times which was appreciated since we ordered our food in several batches. However, she was not very personable or talkative. Towards the end of the meal, the service became a little slow when it was time to pay the bill. Overall the service was solid, but we expected more based on how empty the restaurant was. 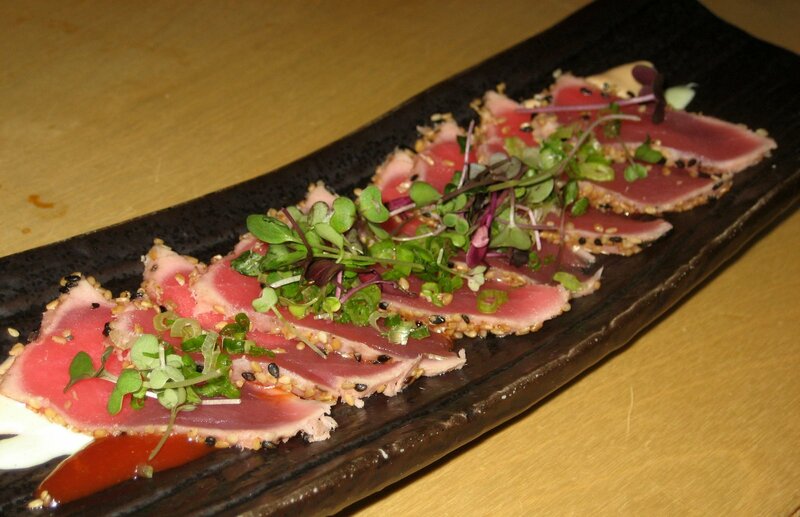 Piranha is located on 3rd street, about a block away from the Convention Center. Parking can be difficult due to its locality, but valet and limited street parking is available. The exterior of the restaurant is unassuming, but akin to other eateries in the area, the interior has an upscale, ultra-modern vibe. The walls feature recessed areas with rocks, plants, and other snazzy decorations. We dined here during daylight hours, so the ambiance was more casual than swanky. But we imagine this restaurant to be more dazzling and mimic Miami-style at night. There are several seating options to choose from including; sushi bar, drink bar, and tables. This place is good for groups or couples, but the chefs mentioned it can get loud during peak hours on the weekend. 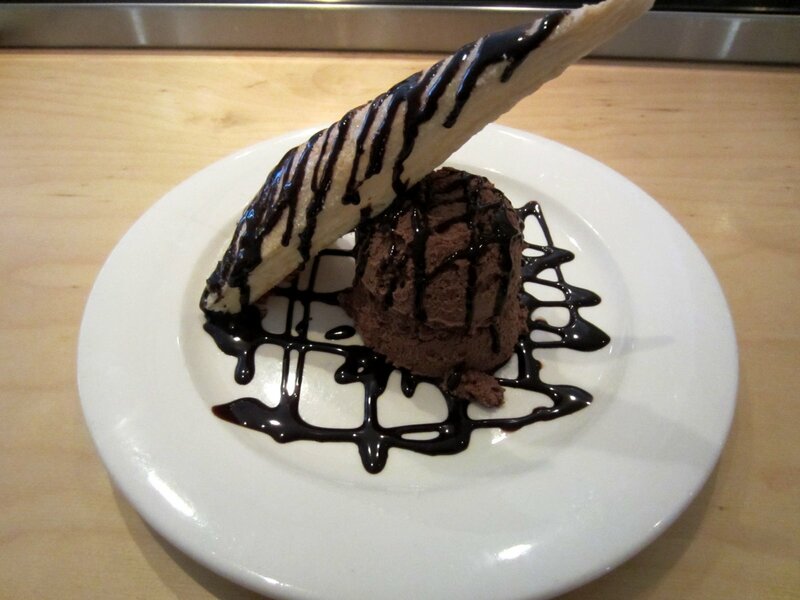 Be sure to put Piranha on your list of restaurants to check out!